Walter Olson, co-chair of the redistricting commission, speaks its first meeting Aug. 27. Next to him is co-chair Alexander Williams, and member Christopher Summers of the Maryland Public Policy Institute. Gov. 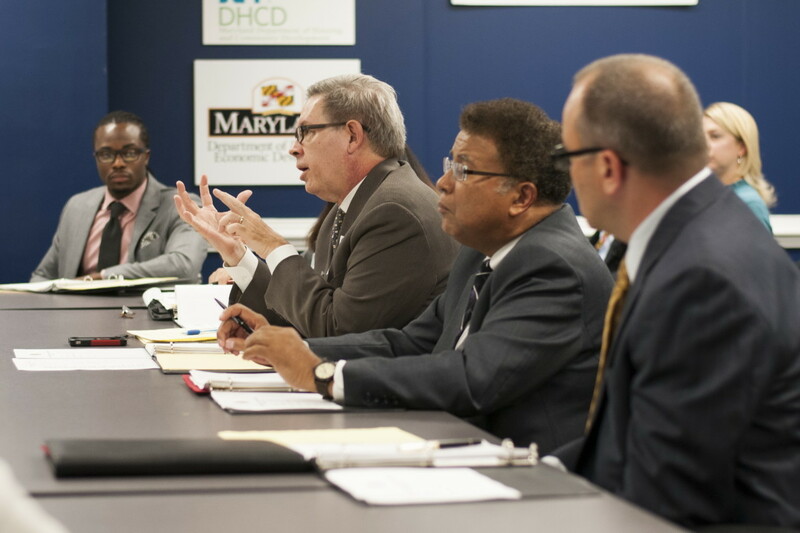 Larry Hogan’s recently formed Redistricting Reform Commission will hold the first of five regional meetings this Tuesday, 6:30 p.m., Sept. 15, in the Minnegan Room at Towson University’s Johnny Unitas Stadium. Hogan created 11-member commission by executive order Aug. 6, and gave it only till Nov. 3 to submit its report to him and the legislature. His executive order made clear he wants an independent, nonpartisan commission to replace the current process controlled by the governor and General Assembly leaders. Maryland’s redistricting process has produced some of the most gerrymandered congressional districts in the country, and more lawsuits about these districts than every state but Texas. “For far too long, the political gamesmanship of gerrymandering has stifled real political debate and deprived citizens of meaningful choices,” Hogan said in the press release announcing the meetings. “Through the work of this commission, my administration’s goal is to put Maryland’s redistricting process on a new path toward transparency, fair representation, and election integrity. TOWSON: Tuesday, Sept. 14, 6:30 Tuesday, 6:30 p.m., Towson University’s Johnny Unitas Stadium in the Minnegan Room. More information on redistricting reform activities, please visit the commission’s website at http://governor.maryland.gov/redistricting-reform.